The stone plaque photographed over 10 years ago was found in a dilapidated state in a pavilion in the Diamond Jubilee Park. The dates on the plaque reflect the tank unit’s stay in Alyth. The plaque was funded by the Regiment in July 1943. 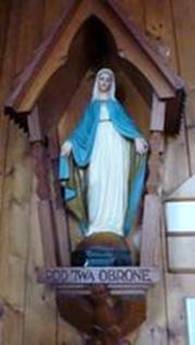 A religious artefact in the style of a wooden wayside shrine depicting the figure of the Blessed Virgin Mary, beneath which is carved POD TWĄ OBRONĘ. At the base of the carving a crowned Polish Eagle. The inscription is the title of a prayer. The religious piece was carved by an unknown Polish soldier and presented to St Luan’s Church. No date known when it was gifted to the Church. The image of the black marble plaque presented to Alyth in November 1943, but now lost. Well before the Alyth Branch of the Scottish-Polish Society was formed, social exchanges between the Scots and their new neighbours, the Poles, had taken place. An early example of these meetings comes from the personal collection of Dorothy Lothian. Pictured across, amongst others, is a moustached Polish Army officer together with Ewa Miszewska (see section on MEMORIES below) at a Christmas party in 1940. 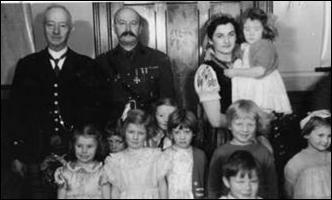 The party was organised by Polish soldiers for Alyth children. Ewa Miszewska is seen holding Dorothy Duncan. Other participation of Poles in events took place on New Year’s Day 1942, where a Polish quartet and a Polish dancer participated with a number of other artistes in an evening concert in the Town Hall, sponsored by the Women’s Section of the British Legion, in aid of the services fund. The WVS branch in Alyth sent 4 large cases of clothing and comforts for the relief of Poles in Russia. In January 1942, Lady Ogilvy-Wedderburn received a letter from Colonel H.P. Mitchell M.P. (British Liaison Ofiicer regarding Polish Welfare) expressing his thanks and confirming that the items had been safely received. In February 1942, the Red Cross Depot in Alyth sent to Colonel H. Mitchell M.P. (Polish Welfare Officer) a number of warm clothing items and blankets for onward transmission to the Polish troops in Russia. These items included a blanket knitted by the girls of Alyth Public School. Some of the cultural and social activities of the Alyth Branch of the Scottish-Polish Society are set out below. 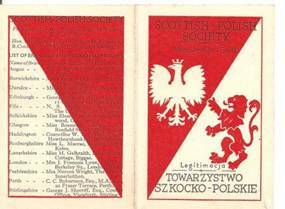 At a meeting in Alyth Public School on 27th March 1942, a branch of the Scottish-Polish Society was formed at Alyth. President of the branch – Mr A.G. Kinloch-Smyth. Two vice-presidents were appointed – one Scottish and the other Polish, namely Miss Watson and Major Sokołowski, the commander of the Polish Tank Battalion. Mr John McIntosh of the Schoolhouse was appointed Secretary. The Council of the branch consisted of 7 Polish and 7 non-Polish members. The Polish members included, Major Bronisław Brągiel (later commander 3rd Armoured Regiment), Captain Marian Kluszczyński (chaplain, – see memories from the collection of Mary Campbell below), Cadet Janiszewski, Sgt Maj Borys and Cadet Corporal Wawrzyniak. The 2 other Polish members were a Mr Nakola and a Madame Gunia. Scottish members of the Council were Miss Edwards, Miss Todd, Miss Lowson, Miss Munro and Mrs Whamond, Mrs Lindsay, Mrs McIntosh. The Alyth Branch held a Polish National Day celebration. This was the 3rd May celebration of the 1791 Constitution of Poland. In the third week of July Alyth Branch held a meeting. In the Public School. Miss Watson, presiding for the President owing to his indisposition, introduced Madam Gunia who gave a lecture on the history of Poland. The Secretary spoke of Lady Carmichael of Anstruther’s protest to the House of Commons against the torture by the Germans of Polish women. A social evening was to be held on 26th September in Alyth Public School. (President of branch Mr A.G.Kinloch-Smyth, Balhary. On Wednesday evening 21st October, the Alyth Scottish-Polish Society were addressed by Mr Kenneth Gibson of Dundee on the subject of “A Mission to Poland”. Mr Gibson was a sergeant in the Black Watch during the 1914-1918 War, and he was chosen to be one of those in Poland during 3rd May Constitution Day – a day for national celebrations in Poland, following the rebirth of Poland in 1918 and an end to 123 years of partition by the Russian, Austro-Hungarian and German empires. On Wednesday 16th December, the Alyth branch were given a lecture by Mr Mund of the Polish education staff. The title of the talk was “Scotland through the Eyes of a Pole”. Mr Mund noted that the Poles soon got to understand Scotland and the meaning of Scottish hospitality. They had nothing but admiration for the Scots. Miss Watson thanked the lecturer for his address. An interesting lecture was given in Alyth Public School on Wedneday evening of the 27th January by Captain Wyglenda on the German occupation of Poland. Captain Wyglenda was before the war a government official in Lower Silesia. Miss Watson, vice-president of the Alyth branch of the Scottish-Polish Society thanked the lecturer. A musical programme followed which included Miss Winter from Dundee (pianist) and two Polish Lieutenants J Rydel (violinist) and J Makowicz (cellist). Miss Watson intimated that the 10th February had been fixed for a whist drive in aid of Polish people in Russia. Many Polish soldiers paid a special visit to Alyth on 10th February to help at the Scottish-Polish Society’s Whist Drive, organised to raise funds in aid of the Polish women and children in Russia. Mr A G Kinloch-Smyth, President of the Alyth Group welcomed the company and Mr J McIntosh Secretary, acted as card master over one of the largest whist drives ever held in the hall. Mrs Gunia, a Polish lady resident in Alyth, handed over the prizes. In reading out messages of goodwill from various Polish units, Mr McIntosh remarked on the excellent relations that had existed during their stay between their visitors and the townspeople. Colonel Wróblewski (Army Signals) said that their friendship had stood the test of time. The Polish soldiers still return to visit their friends. The total amount raised was £66.5s.0d. Thanks are due to Mrs Lindsay, Mrs McIntosh and Miss Wilkie, convenors, and to Miss Edwards and Miss Todd, secretary and treasurer, for making such a success of the entertainment. At a meeting of the Society in the Public School, £65 was forwarded by the Committee in aid of Polish women and children in Russia. £10 had been sent earlier in the year. On Saturday, 20th March at a meeting of Alyth branch of the Scottish-Polish Society, a lecture was given on the life of “Ignacy Paderewski, Poland’s First Premier”. On Tuesday 4th May, the Alyth Branch organised a celebration of Poland’s Constitution Day (3rd May). A short address was given by Lieutenant Maciurzynski and then there followed a musical programme, which included Polish artistes. Solos were sung by Cadet Galiński (baritone) and tenor Private Rozwens. Lt Rydel (violin), Lt Makowicz (cello) and Cadet Gorzkowski (piano) were the instrumentalists. In the chair was a Miss Watson and a good audience included a number of British soldiers heard about the 1791 Polish Constitution. Later in May, at the Public School, the Secretary (Mr John McIntosh) reported to the meeting concerning the activities of the Branch held during the year – lectures, musical and social evenings. Current membership stood at 85, 73 local members and 12 Polish. Mr A.G. Kinloch Smyth was now Honorary President with Miss Watson as President and Miss Wilkie Vice- President. Committee members drawn from the Polish Army were the same as in 1942. The Polish members included, Major Brągiel, Captain Kluszczyński, Cadet Janiszewski, Sgt Maj Borys and Cadet Corporal Wawrzyniak. The 2 other Polish members were a Mr Nakola and a Madame Gunia. On the 22nd June a talk was given at a meeting of the Society by a Pilot Officer of the Polish Air Force on his experiences as a POW in Germany. Afterwards songs were sung by Cadet Galiński (baritone) who was accompanied on the piano by Lt Formanowicz. A report by the Honorary General Secretary of the Scottish-Polish Society of the 24th July 1943, notes that 7 sub-branches of the Scottish-Polish Society fell within Perthshire Branch. The Honorary General Secretary of the Alyth Sub-Branch was Mr John McIntosh M.A. F.S.A.Scot. His address was given as The Schoolhouse, Alyth. Though figures were incomplete, Perthshire Branch in total had over 1,000 members. This represented the second highest figure in Scotland for all the main branches (including sub-branches) of the Society. In late October 1943, in the Victoria Hall, a Scottish-Polish concert was held in aid of the Relief Fund for Polish Children. Later in November, the Alyth Scottish-Polish Society were given a lecture entitled “A Journey Through Poland by a Polish officer, Lt Maciuzynski in the Public School. Afterwards solos were given by Private Rozwens who was accompnaied by Miss Hunter from Kirkcaldy. A gift of a tablecloth helped raise over £10 for the Polish women and children’s fund. 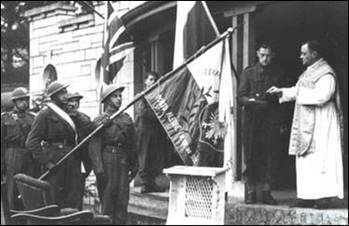 In late October 1940, the first Polish troops arrived in Alyth. These belonged to the HQ Central Training Camps, a Medical Training Centre as well as part of the Signals Training Centre. Additionally an ambulance column and an armament park were situated on the west side of the village. Quarters for the HQ Central Training Camps were good; other units generally good with the exception of the ambulance column. Accommodation for the signallers was in schools and church halls that lay empty. Various signals courses commenced. Other signals troops were accommodated in Meigle, at Belmont Castle. By February 1941, Alyth was still home to the Central Training Camp HQ of some 80 men, elements of the Signals Training Centre and a 21 man strong Military Police platoon. In addition, there was an Armament Park of about 50 men. The HQ Central Training Camp was dissolved in July 1941. A Polish Town Major’s Office also existed and was known as ‘Komenda Miasta Alyth’. On 1st August 1941 the 3rd Tank Battalion (later re-numbered to the 67th) was formed and based at Alyth. The unit was built around the tank squadron of the 1st Corps Recce Group. In the summer of 1941, 300 Polish recruits from South America - Uruguay, Brazil and the Argentine, were stationed at a camp in Alyth. In 1941, 908 men from South America volunteered for service in the Polish Armed Forces. [see photo below] The principal commander of the battalion whilst it was stationed at Alyth was Major Bolesław Sokołowski. The adjacent photograph shows a group of Polish volunteers from Brazil outside the Fyfe-Jamieson Pavilion, in the Diamond Jubilee Park, Alyth in 1941. Their standard bears the name of Porto Alegre in Brazil. This city was made up of a very large number of people of European descent including many Poles. The chaplain on the right is consecrating the standard of this group of volunteers. At the beginning of the year, in addtion to the Army Tank Battalion, signals and workshops of the 16th Army Tank Brigade were located in the town. By April 1942, Polish units stationed here had moved to the Scottish Borders. In August 1942, the battalion was reorganised into the 3rd Armoured Regiment. It was probably not until 1945 that Polish troops returned to Alyth. A small Polish working party was involved at the beginning of the year in trenching for a new water supply at Barony Hall Camp, Alyth. By late February 1945, units of the 1st Grenadier Brigade (4th Infantry Division) moved into Alyth (and Forfar). Soldiers of the 1st Grenadier Battalion remained in Alyth up to July 1945 at which time they moved to the north of Scotland, to Forres. Whilst in Alyth, the battalion was located to the north-east of the town, at Loyal House. On 20th April 1945, whilst at the Loyal Military Camp in Alyth, one of the soldiers of the battalion – 37 year old, L/Cpl Franciszek Kitel took his own life by hanging himself. He was found dead in woods adjoining Loyal House. He was later buried in Perth’s Wellshill Cemetery. In August 1945, the 1st Battery of the 4th Lt AA Regiment moved to Alyth with the rest of the regiment stationed at a camp near to Alyth. (Alyth-Meigle area). The following month saw the first party of soldiers who volunteered for repatriation to Poland leave the regiment. In January 1946, the 4th LAA Regiment moved to an airfield in the north of Scotland. Polish working parties of the 4th Infantry Division were involved in clearing up training areas to the north of the town. On the 12th January 1946, 22-year old Sapper Stanisław Szymański of the 7th Engineer Company (7 komp sap) commited suicide by hanging himself whilst at the Detention Barracks at the Loyal Polish Army Camp. He was later buried at Perth Wellshill Cemetery. Sapper Szymański was born in the Tczew District of Poland. At the time of his death the 7th Engineer Company was based in Blairgowrie. The Artillery Training Centre Command was stationed in the area, probably at Loyal House. It moved away in August 1946 to Inveraray. The Studies Section of the Artillery Training Centre was located at Barony Hall. 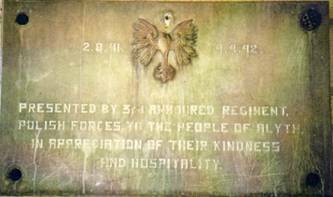 In October 1943, the Polish Army intimated to the Alyth Branch of their intention to present a plaque from the 67th Tank Battalion (now 3rd Armoured Regiment), which had been stationed in Alyth to mark their appreciation of the kindness shown to them during their stay. The Poles wished that the plaque be placed outside the Town Hall and arrangements made to unveil the plaque on the 30th October. The Town Council however desired that plaque be seen before being erected and temporarily postponed the date of the unveiling. On the 15th November, the Evening Telegraph reported the ceremonies surrounding the unveiling of a Polish plaque at the Fyfe-Jamieson Pavilion in the Diamond Jubilee Park. Żebrowski, Captain Kluszczyński, Cadet Janiszewski, Cadet Officers Wawrzyniak and Strzaleski and Corporal Grzy… . Sharing the platform were Provost and Mrs Morrison, Bailie and Mrs Sim, Mr William Ritchie Smith, Mr C G Anderson, Councillor Kinloch Smyth and Miss Louvain, Councillors Mortimer and Petrie, Mrs and Mrs C D Shepherd and Mrs C K Shepherd. Representatives from the Scottish Polish Society branch, namely Miss Watson (president), Miss Wilkie (vice-president), Mr McIntosh (Secretary), as well as Mrs J Lindsay and Madame Gunia. With Bailie Sim presiding, Captain Żebrowski unveiled the plaque. The Provost of Alyth accepted the gift on behalf of the people of Alyth and thanked the Polish Forces. Miss Watson called for votes of thanks to the Provost, Bailie Sim, and to all Polish friends who had helped at the ceremony. Later the Town Council entertained the Polish group to tea in the Commercial Hotel. At the AGM of the Alyth Branch of the Scottish-Polish Society in April 1944, it was reported that in the last session the Alyth Branch had sent £66:5s. for the relief of Polish women and children, £5 to the Red Cross POW Fund and £10 to the Poles in Russia. At the meeting amongst those appointed office bearers were :- Mr A G Kinloch-Smythe of Balhary (honorary president), Provost Sim (subject to acceptance – honorary president), Miss Watson (president), Miss Wilkie (vice president), Mr J McIntosh – (secretary) and Miss Oram (treasurer). There were a further 10 lady members of the committee and 5 members of the Polish Armed Forces. A few days later, Mr John McIntosh died whilst on holiday. Whilst at Alyth, as headmaster he took a deep interest in the affairs of Alyth. He held a number of local appointments including that of Secretary of the Scottish-Polish Society in Alyth. In April, the Alyth Branch held a whist drive and dance in the Town Hall. Provost Sim stated that the object was to name an Alyth bed in the General Sikorski Childrens’ Hospital to be built in Warsaw. They had so far raised £50 and were hoping to raise a further £250 in the near future. Outside of the activiities of the Alyth Branch, the local football team, Alyth United, (who lay bottom of the Midland league after having lost 10 successive matches) pulled of a great surprise by beating St Johnstone Y.M. Their shock win had much to do with several Polish soldiers who played for the team. On Saturday 3rd November, the Scottish Polish Society – Alyth Branch held a successful sale in the Town Hall in aid of the Sikorski Childrens’ Appeal. With the 1st Polish Armoured Division engaging the enemy as from 8th August 1944, casualties occurred within the Division. These casualties could have a profound impact on the lives of some Scottish women. On the 9th August 1944, Corporal Czeslaw Czust of the 1st Armoured Regiment (1st Squadron) was killed in action near Soignolles, in Normandy. His tank was hit by anti-tank gunfire. He was 26 years old when he died. Corporal Czust left a widow – Jean Lindsay of Walnut Cottage, Alyth. It was only about 30 months ago on 4th March 1942 when the couple married in Alyth. Corporal Czust was amongst the first group of soldiers that came to Scotland in the summer of 1940. Entries made in an autograph book belonging to Mary Campbell of a Polish soldier in Alyth – Zygmunt Serwiński from Rzeszów, a Polish military chaplain – Captain Marian Kluszczyński, and one from a soldier (signature illegible) who heads his entry as a “Polish wanderer”. I am grateful to the owner of the book for contacting me and providing the link to images from the book. Capt Kluszczyński (born 1894) had been a chaplain with HQ 3rd Infantry Division in France, then with the 16th Motorised Artillery Battery based in Scotland. Amongst a number of personal items kept by Dorothy Lothian are photographs of a Polish lady who for a time stayed in Alyth with the Duncans in Glebe Crescent. This lady, Mrs Ewa Miszewska was later to become the organiser and Commandant of the Polish equivalent of the Women’s Royal Naval Service – in Polish known as Pomocnicza Morska Służba Kobiet (PMSK). Born in Kiev, Russia in 1916 she graduated from high school and passed the high school diploma in humanities. She went on to higher education and attended the Institute of Physical Education in Warsaw and graduated with a master's degree. During her studies, she completed an additional course gaining a diploma as a military training instructor. She also tried her hand at journalism, specifically sports journalism and received a half diploma from the Warsaw School of Journalism. The invasion of Poland and the subsequent defeat of France found her evacuated to Britain and now living in Alyth. In an academic piece written by Dr Jarosław Tuliszka for the Polish periodical “Przegląd Morski” in November 2003, he refers to the fact that “it is difficult to say what she did for the first three years of residence. It's not in her military personnel records.” From Dorothy Lothian’s collection it is clear that she stayed in Alyth, although it is not known in what capacity. The adjacent picture does show her in a Polish Army forage cap on which there is a Polish eagle and her greatcoat bears the “POLAND” national insignia. Her record shows that in September1943 she became a volunteer in the PWSK – (Polish equivalent of the British Women’s Royal Army Corps). She trained in the PWSK as well as officer training in the British Wrens. 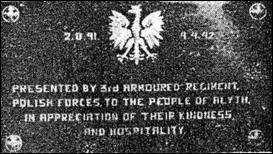 It was in July 1944 that the Polish Ministry of National Defence ordered the organisation of the PMSK. By March 1945 she was in temporary command and four months later permanently entrusted with this role. 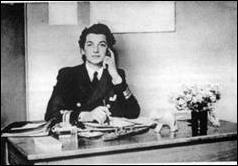 Across photo of Ewa Miszewska at her desk in the uniform and rank of Junior Inspector of the PMSK. 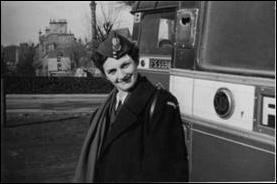 With the disbanding of the PMSK she joined the Polish Resettlement Corps in April 1947 and rather than return to Poland she emigrated to the Argentine. She embarked on the troopship “Empire Trooper”, leaving Southampton on 18th June 1948 for Buenos Aires. Her occupation as shown in the passenger list was P.T. Instructress. She also ran her own beauty salon. She died aged 65 in July 1972 in Mendoza. 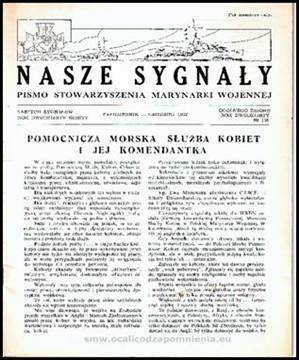 On the death of Ewa Miszewska on 17th July 1972 the Polish Naval Association’s periodical “Nasze Sygnały” (Our Signals) for October to December 1972 carried an obituary about the former Commandant of the PMSK on its front page. The obituary in Nasze Sygnały hardly dealt with her life before the Navy. There was no reference to when she was born and where or to her marriage. Indeed how and where she had died and in what circumstances. No mention of her emigration and life in South America. Only a brief mention of her pre-war qualifications. Instead the writer made the point that in contrast to the educated and healthy applicants for the British Wrens, the Polish women, many of whom had suffered deprivations, had little or no education, poorer health, were very young or exceeded normal military age. Their main qualification was their enthusiasm. The head of the Polish Women's Auxiliary Service had much work on her hands compared to her British counterparts. The women required a long period of recovery and treatment. The head of the team had to be a soldier, counsellor, guardian, custodian, teacher, judge ... Ewa Miszewska fulfilled her duty to turn the girls into a first class support service with "great credit". After the war there was the problem of preparing the young girls for civilian life. The author of the obituary notes the great help of two women, former subordinates of Ewa Miszewska's, who assist the Polish Naval Association in its work. They asked to say how respected, valued and loved she was. I am grateful to Dorothy Lothian for sharing her wartime reminiscences and to Dianne Brown for her support.